The economic downturn has thrown even the most fiscally prudent governments for a loop. Dollars are stretching thin and new approaches to employee compensation are spreading across the nation. In light of the effects of the economic downturn, and as a measure to prevent similar fiscal vulnerability in the future, governments are particularly honing in on the manner in which they provide pension benefits. Everything from employee contributions, to retirement ages, to benefit levels are being reconsidered. 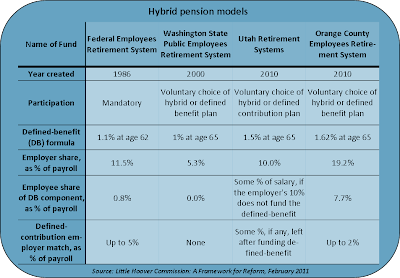 One concept receiving new attention is the use of hybrid pension systems. Hybrid pension systems are not new, but a lack of regulatory guidelines and several legal ambiguities suspended interest. In the last few months, greater clarification of federal guidelines for establishing hybrid plans has taken place. This may be what is needed to reinvigorate the hybrid conversation. Just this week, California’s Little Hoover Commission has suggested such a shift for California’s pension system. Unlike private sector employers, most governments have stayed loyal to "defined benefit" pension systems. In such a system, regardless of the pension fund’s investment earnings, an employee can have confidence in receiving a certain pension payment upon retirement. This approach shelters government employees from unfavorable economic realities and requires the government to shoulder all the risk. When exposed to the downside of the risk, governments typically reallocate money away from other public service areas to appropriately fund their pension systems. Most employers in the private sector have responded to market declines by switching to "defined contribution" (usually 401(k)) plans, which put the risk on the employee with benefit levels dependent on investment results. Many governments have contemplated similar moves, yet wrestle with whether or not switching to defined contribution plans will eliminate one of the key attractions to government employment and whether those plans provide for appropriate retirement security for their employees. With federal regulations now better established for hybrid systems, pension options could be less polarized, a sentiment echoed in this Wall Street Journal article. Hybrid pension systems have gained traction because they remove some of the risk from governments, providing them with more shelter from poor stock market returns. However, unlike 401(k)-style systems, hybrid systems do not transfer the entire burden to employees. The risk is spread, instead, between both the government and its employees. This compromise could serve as a tool to both lessen the impact of market decline and protect an attractive benefit of public sector jobs. There are various forms, but hybrid systems have the same basic composition – part defined benefit (usually a lower fixed benefit than the prior defined benefit plan) and part defined contribution. Benefits are viewed as hypothetical account balances and the accrued balance is portable, meaning it can be moved when an employee leaves government service to 401(k)s of his/her subsequent employers. Given that market uncertainty has caused defined benefit pension systems to significantly strain public services, as well as fierce public pressure to put public sector compensation in line with that of the private sector, hybrid plans are likely to continue to attract the attention of policy makers across the country. That attention has not taken shape in Wisconsin, however, with hybrid plans having yet to be picked up in the swirl of discussion surrounding local pension reform.